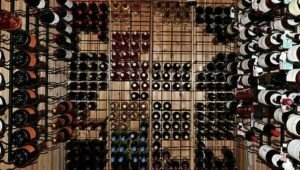 What Should You Consider When Storing Wine? Wine is alive. Being as this fermented beverage is alive, it reacts either positively or negatively to its environment. How wine is stored will determine how fast or slow a bottle will age. Wine needs to be kept in a clean, dark, damp place with good ventilation. It should be stored vibration free and at a constant temperature. An old castle cellar may be the traditional place for storing wine, but nowadays climate-controlled storage facilities are the best way to store wine that has value. Your downstairs bedroom closet is not a great option. The sommelier we have guiding people through our Wine Tasting Seminar outlines all of this. Temperature is the most important factor in storing wine. The optimum storage temperature is 50 to 55°F (10-12°C), however maintaining a temperature within 40-65°F (5-18°C) will do. A slow change of temperature of ten or so degrees between winter and summer is fine. Fluctuations on a daily or weekly basis cause your wines and age prematurely. As the wine and any trapped air in the bottle expands and contracts, it may damage the integrity of the cork. Minute quantities of wine move alongside the cork allowing oxygen to seep back in. You will notice damage of this nature from a sticky deposit that often forms around the foil cap. Watch your bottles closely for this. Wines kept at too high of a temperature will age faster than wines kept at a cool temperature. Wines kept at 68°F will age twice as fast as those kept at 50°F. At 55°F (12°C) wines will age slowly and acquire greater complexity. This is not to say the colder the better. Wine that is stored too cold can develop deposits or other suspensions in the wine. Note that white wines are affected far more by temperature problems than red wines. Moderate humidity is important so as to keep the corks in good resilient condition and thereby prevent them from shrinking. A relative humidity of 50-80% is the acceptable range, and 70% is recommended. Excessive humidity will not harm the wine but will cause the labels and any other paper products – like cardboard boxes – you have in the cellar to rot. Insufficient humidity may cause the corks to dry out, lose their elasticity and thereby allow air to get into the bottle. Light will prematurely age a bottle of wine. Naturally, clear bottles are most susceptible to this problem, but ultraviolet light will penetrate even dark coloured glass. Ultraviolet light result in unpleasant aromas and ruin the wine. Extra care should be given to sparkling wines as they are more sensitive to light than other wines. It should be noted too, that incandescent or sodium vapour lights are better for a cellar than fluorescent lighting. Constant vibration from machinery or a nearby road may disturb the sediment in a red wine and can be harmful to all wine. This is not commonly a problem in the average home as dangerous extremes are rare and obvious. It should be remembered that excessive sound creates vibrations that may be harmful as well. Wines should be stored in such a way that you don’t have to move them around to get at a particular bottle. Once a wine is laid down, it should stay until it is opened. Red table wine is stored horizontally so that the wine stays in contact with the cork. This keeps the cork moist, thereby minimizes air from entering the bottle. Fortified wines (other than Port), are stored standing upright. White and Ice/Dessert Wines should always be kept chilled and refrigerated for best enjoyment. The space should be free from smells and debris. Extraneous smells can enter through the cork and contaminate the wine. Proper ventilation will help with this problem and prevent a musty taste from developing. Finally, debris that could be a home to insects that might infect the corks should be removed. Never store fruits, vegetables, cheeses or any other food that is capable of fermenting. We at Fine Art Bartending Vancouver spend a little time talking about Wine and Brandy during our regular 32-hour bartending course, but many of the nuances of wine can only be captured through a more in depth seminar. We hold these wine tasting classes in Vancouver about every 6 weeks, so have a look at our upcoming class page and join us for an evening. Sipping wines and learning in a bar-like classroom is a very fun night out.